This is my last week as a production editor at the Rowman & Littlefield Publishing Group. So I thought I'd round out the week with posts on favorite books that I've worked on during my 15 years there. 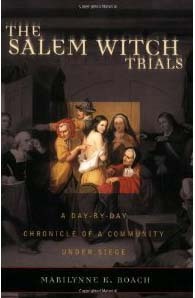 My hands-down favorite is The Salem Witch Trials: A Day-by-Day Chronicle of a Community Under Siege, by Marilynne K. Roach. Roach gives chronology of events over about a five-year period. The chronology approach is ingenious because you get details on what exactly happened, not just a summary or interpretation. And, most important, Roach gives an unparalleled sense of what life was like for occupants of a small town in the 1600s: their fears, their mindset, the physical reality of their lives, and more.